A trend that I have noticed on my intake forms from new clients over the past 4-6 months is that there are 2 questions answered that breaks my heart. Both are yes/no questions. Question #1: Did you feel safe growing up? Question #2: Have you ever been abused? I can say more often than not, I have seen more ‘Noes’ when asked if they felt safe growing up and I have seen more ‘Yeses’ when asked if they have ever been abused. And a common ailment in those answers are autoimmune conditions. Is there a direct correlation? I wouldn’t rule it out but that’s just based on my observation. I’ve had conversations about this with colleagues as well as I’ve talked about these similarities in my workshops. But what I didn’t know, is that my speculation has already been quantified. I was recently introduced to the ACE study. I hadn’t heard of it but as it was described, I had to go find it. The ACE Study (Adverse Childhood Experiences) was conducted between 1995-1997 and eligible for follow up through 2005. ACEs included childhood physical, emotional, or sexual abuse; witnessing domestic violence; growing up with household substance abuse, mental illness, parental divorce, and/or an incarcerated household member. In an autoimmune analysis based on those results, the outcome was hospitalizations for any of 21 selected autoimmune diseases and 4 immunopathology groupings. 64% reported at least one ACE. First hospitalizations for any autoimmune disease increased with increasing number of ACEs. Compared with persons with no ACEs, persons with >or=2 ACEs were at a 100% increased risk for rheumatic diseases. Follow up of these people weren’t just narrowed to autoimmune conditions. There were all sorts of chronic disease problems from headaches, heart disease, cancer, and COPD. Especially with autoimmune conditions, you need a two pronged approach, especially if you have a higher score on the ACE questions. You can only get so far by throwing a nutrition, movement, or supplement solution at a psychological trauma cause. The opposite is true as well. You can’t out meditate a physiological trauma cause. While many issue may have had a single event catalyst, that doesn’t mean the damage is over. When the hurricane or tornado rips apart your city, the cleanup and repair takes far longer than the event actually occurred. While the event may indeed be traumatic, the real trauma occurs in the days weeks, and decades following. Don’t assume that because you’re safe now, that there won’t be residuals that need to be addressed both psychosocially in addition to physiologically/metabolically. If you’re struggling with your health despite feeling like you’re doing everything right you know how to find me. But maybe diving into your past a bit with some self analysis can shed light onto your current health expression and answer why you are hitting certain roadblocks. 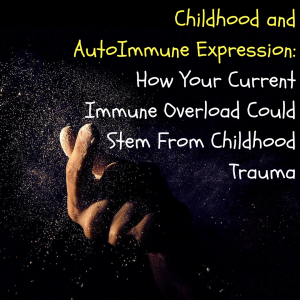 This doesn’t mean that every autoimmune condition has emotional trauma nor does it mean that every emotional trauma will lead to autoimmune expression. But it does create a connecting theme of understanding your root cause. 3 of My Favorite Energy Gadgets that I Use on a Regular Basis but Actually Have No Idea if they Work.